How will they level the seismometer? Pick it up a little and jiggle it? Scrape sand away on the high side first (or only)? It has motorized leveling legs that will level its base horizontal. They will also minimize thermal contact with the ground (which would otherwise constitute an important source of noise, remember SEIS is sensitive enough to detect jiggles smaller than an atom!) and ease the instrument settling on the porous ground. Hope this is OK to post. I've used an InSight NASA sound download to create an electronic composition. The thing is, the vibrations recorded were very low frequency - almost inaudible with our human hearing range - but the recordings from the InSight seismometer contain so much complex waveforms and audio information you can make almost any sound with them! Can the seismometer gather local stratigraphic information from the activities of the mole? A layman's question. Does the operation of the mole degraded the performance of the seismometer since the mole is operating so nearby? It would while it is operating, it would create a lot of noise. However the signal may be processed to yield other information,hence my question. I don't think it does answer the question. The hammering is just a byproduct of the engineering solution chosen to deploy HP3 to the required depth. If SEIS can get some information from it, that's a cool bonus, but it certainly isn't the reason the two instruments were flown together. The hammering of the HP3 mole into the ground to 5 m depth to measure a vertical thermal conductivity profile will generate seismic signals that provide a unique opportunity to investigate the shallow martian subsurface (meters to possibly few tens of meters) using seismic-exploration techniques (Kedar et al. 2017). It is expected that the mole will require several thousand strikes to reach 3-5 m depth and each strike will generate a seismic signal. An adapted seismic-data sampling strategy to increase the recorded frequency bandwidth (e.g., Lognonné et al. 2018) will enhance the data analysis such that the signals can be used in a manner similar to high-resolution active seismic experiments conducted with sledgehammers for terrestrial engineering and environmental applications (e.g., Schmelzbach et al. 2005). The near-surface elastic properties can be derived from measurements of P- and S-wave velocities and attenuation, Q, and will be used to reduce travel-time and amplitude errors of globally propagating seismic waves as well as help test hypotheses on the shallow structure of the landing site. As far as interference with SEIS primary mission goes, the cadence of the HP3 deployment is pretty low: https://www.seis-insight.eu/en/public-2/the-insight-mission/other-instruments states that it will wait 48 hours every 50 cm, and this LPSC abstract https://www.hou.usra.edu/meetings/lpsc2014/pdf/1325.pdf states that the individual hammer strokes are 3 sec apart. Ok let's see how many conspiracy UFO theories will be started by this picture! SEIS now has company via the HP3. They moved it surprisingly fast. Would that be because of practiced moves or motivated to rush by fear of (the American) government shutdown again? 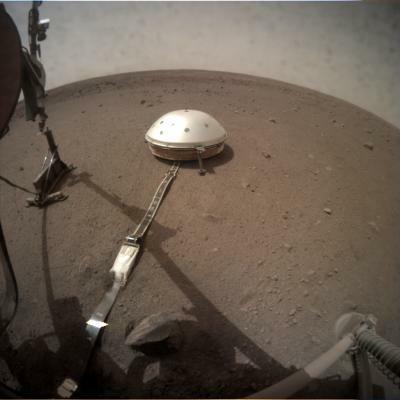 There's a chance that, when InSight detects Marsquakes, some Marsquakes might come from the South Pole and its underwater lakes. A study suggests even brine water might need extra heat to be liquid on Mars, and it is implied magma might be moving around. The mole has hammered for its maximum 4 hours yesterday and has reached a depth of at least 18 cm and not more than 50 cm, but not the planned 70 cm. The data indicate that the mole has reached that depth within about 5 minutes but then soon encountered an obstacle (the exact depth of which is not known). There's a chance that, when InSight detects Marsquakes, some Marsquakes might come from the South Pole and its underwater lakes. There is no scientific consensus that such "lakes" actually exist and a lot of doubt about the interpretation of the data. Anyone got a guess how long before DLR determines that the Mole is not going any deeper? Update from DLR may help.